Objective: Operate a tractor loader according to safe standards. Present information below on tractor loaders, rollovers, and safe practices. Have an experienced operator demonstrate equipment and safe practices. Supervise workers closely while they practice using the tractor loader safely. Note: Do not allow workers to practice on a tractor loader unless they are qualified operators. Tractor loaders are helpful for moving materials from one place to another. However, a fully loaded loader makes the tractor front heavy and could cause an incident. Only install loaders designed specifically for the tractor to reduce the chances of rollover or malfunction. A raised loader changes the center of gravity of the tractor and can cause the tractor to tip under conditions that would normally be safe. Also, tractor loaders often operate in confined areas that make short turns unavoidable. Both of these factors make loader-equipped tractors susceptible to rollovers. Watch carefully for obstructions and depressions. Handle the rig smoothly, avoiding quick starts, stops, and turns. Keep the bucket as low as possible when turning and transporting. Ballast the tractor loader combination as recommended by the manufacturer. Or, attach wheel weights to the rear axles or wheel rims. Weight may also be carried by a three-point hitch. Adjust the width of the tractor as wide as practical or possible. Use a front end loader only for its specific purpose. It should not be used for removing fence posts, towing, or knocking something down. No riders on the tractor! Lower loader arms slowly and steadily. When turning, adjust for the extra length of the loader. Raise the loader in an area free of overhead obstacles, such as overhead power lines. Keep the loader low while carrying loads and/or while driving on an incline. Use special care when driving over uncompacted soil, which can be unstable. 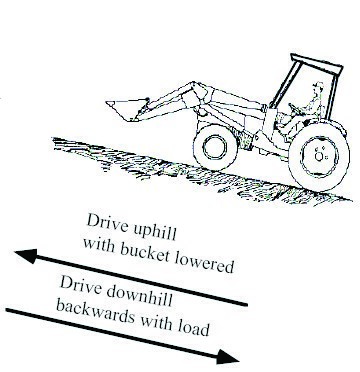 Drive loaded buckets uphill rather than downhill, and stay off steep slopes to prevent bouncing and loss of control. Back filling (replacing dirt) can cause new construction areas to collapse. Watch for falling rocks and cave-ins when undercutting. Stay away from the outer edge of banks and slopes. 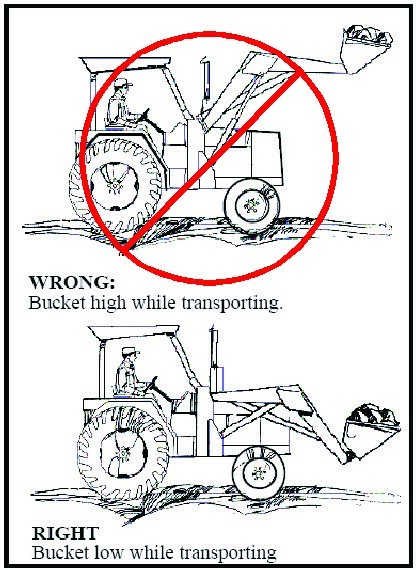 Load the bucket evenly from side to side and keep within the normal capacity of the tractor and loader. Use the recommended amount of ballast to give the tractor extra stability. Never tow a tractor by attaching a tow chain or cable to the loader. Never allow people to ride in the bucket. A load should not be moved or swung with people in the work area. Operate controls only when seated on the tractor. Remove the loader from the tractor when the loader is not in use. Physically block the bucket and/or arm if they have to be raised for maintenance. Never walk or work under a raised loader. Put the loader on the ground, turn off the engine/electric power, then dismount. Be sure the tractor has back-up alarms in case the driver’s view to the rear is blocked. Round bales should not be handled without the attachments recommended by the manufacturer, such as bale forks, spears, grapples, or huggers. Do not exceed the weight limitations of the loader when moving heavy loads—sod pallets, containers, pavers, wall material, and soil, for example. Carry the bale slowly and as low as possible to the ground. When handling round bales on a slope, always approach the bale with the tractor facing uphill. Never use the tractor loader to stop a rolling bale. Tractor loaders can be dangerous because they affect a tractor’s center of gravity. Watch out for others when working with a loader. Ballast and adjust the tractor for the load to prevent accidental rollovers.